The weekend couldn’t come quick enough for me and seemed such a long week until it finally arrived. Saturday I woke with a feeling of knowing exactly what I wanted to do, but I didn’t really want to do it. It was going to be messy, it was going to hurt and it would never be seen. But that is the nature of restoration that I have learned so very quickly. The job in question was removing Waxoyl from inside the car roof. As you may or may not know, I had fun and games removing it from the floor pans before I treated them with POR15 paint. This time it was above me and I wasn’t too sure how I was going to attack it. Red Bull drinks were lined up and snacks were lined up like little toy soldiers on my Blue Point work cart, I knew what was coming. Plan A; was to rub the wax off with a bunch of rags and degreasant, I tried but I only seemed to spread it about and not remove it fully. Plan B; drink Red Bull and find a scraper while eating a snack. This gave the poor ol’ bloke arm muscles time to recover from half an hour of what seemed like somebody setting fire to them, they were burning that much. The man cave has lots of things that I have stored, (not hoarded – Stored) to choose from. I found all sorts of flexible implements that I could try and felt rather pleased with myself walking back to the garage. Trials were undertaken for the best tool. First was a plastic separator for a tool compartment – that was too soft, but would make an excellent filler spreader tool. (Note made to self at this point, for a small spreader use this bit of plastic). Secondly I had a silicon sealer remover, this was OK but too small and hurt the hands due to the funny angles on it. Thirdly I had a pallet knife that was good but again to small and too stiff and dug into the metal on more pronounced curves as it was sharp. The winner was an old filling knife I used for decorating, it was flexible and formed to the very slight curves of the roof, it didn’t dig into the metal and scraped of a good amount each time. I started from the back to the front and the flex of the blade followed the roof well. The whole process was messy as the skin grafts of wax were raining down on me and went everywhere. At the start of the work you can see the roof under the wax which wasn’t pretty but it worried me a bit as it looked rust coloured, so I wanted to protect it best the best way possible. I took a photo of half the roof done for a comparison with and without the Waxoyl to show what it was hiding. The mess was unbelievable and the old towels I had put down were not enough to cope with the mess. The side pillars at the rear were also cleaned up but were going to get a slightly different process. Snacks were consumed and a fair amount of water taken into the system. Arms are now aching beyond belief. Once the roof was stripped of the wax I had to degrease it with the strongest mixture of POR Marine Clean I could mix up on 1:1 basis. This cut through the grease and left a very clean surface after a couple of treatments. this was left to dry thoroughly. I used a full tin of Rust Prevention paint (picture on the process page, or click here) as this time as there was no real rust to be fair. The paint required two thin coats within ten minutes of each other. They looked a little patchy when drying but the end results was amazingly smooth and consistent to a whitish grey in colour. The side pillars were a different story as the bottoms by the shelf was rusted a little more and need some treatment of the Granville Rust Cure. Once that had dried off too I used some Eastwoods Rust Encapsulator to spray behind the pillars into all the little gaps then sprayed the outside all the way down to the window winder area. The satin black cuts the light down in the car again. Around the roof where the inner rail is there was not enough prevention spray for all of it. So I decided to Eastwood those areas too, while trying to prevent a little over spray not that it would ever matter of course. Another note to self; start on the rear shelf soon. The end result looks quite good due to a contrast of the black and white, the down side is once the head liner goes in – Nobody will ever see it and nobody will ever know! 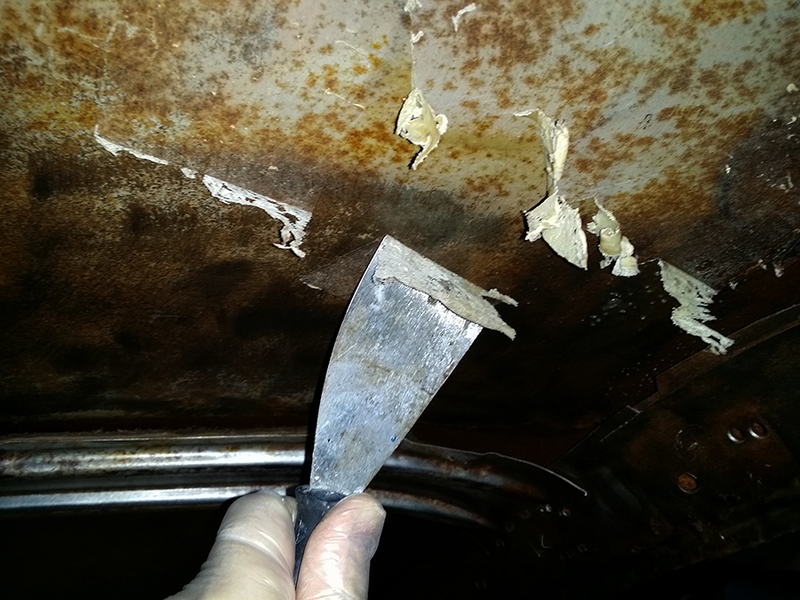 For the full process so far of the work; Photo Menu – Inside The Car – Roof & Sides Rust Treatment, or click here. This entry was posted in Car, General, Photo's and tagged blue point, Eastwood, granville rust cure, headliner, Mustang, por15, Red Bull, removal, Roof, rust, Wxoyl. Bookmark the permalink. Wow Mart, saying “Labor of Love” is easy but delivery is surely difficult, this is impressive job! Holy Moly! What a dirty hobby you picked lol. It was looking pretty bad, there is a obvious comparation between before and after. All done, Mart! Lol, I was absolutely covered. I looked like a paper mache bloke. It even got in my ear. Still it was worth it. Even though there was a little black over spray on the nice white. Shh don’t tell anybody but you can see it in a photo. Lol. You know and that’s what counts, I did the same thing when I did my car, great job. Nice job so far Mart. Thank you. She does seem to be taking on a life of her own now. Great to know other readers appreciate the hard work too. Thank you. It really does feel good to know that other readers of my little ol’ blog can see the work that goes into these projects. Thank you, there was a lot of head scratching and eatingvand drinking goin on. As for the car it came over to the UK from Virginia in the ’90s by USAF worker and here it stayed since. Wales is beautiful country but the weather not so good to put it polity. I wonder which air base the USAF worker was based at? I lived just down the road from Greenham Common through most of the 80’s and early 90’s. In fact I used to drive past GC every day in the 90’s in my old Land Rover on my way to work or to friends houses. He was based at Lakenheath. He then sold the car when he went back to the USA and couldn’t be bothered to take the car back. It was the guys daily ride.